We’ll call it Tuesday’s Tips and Tricks….for lack of a better approach. I think this one came from my friend Abby originally. 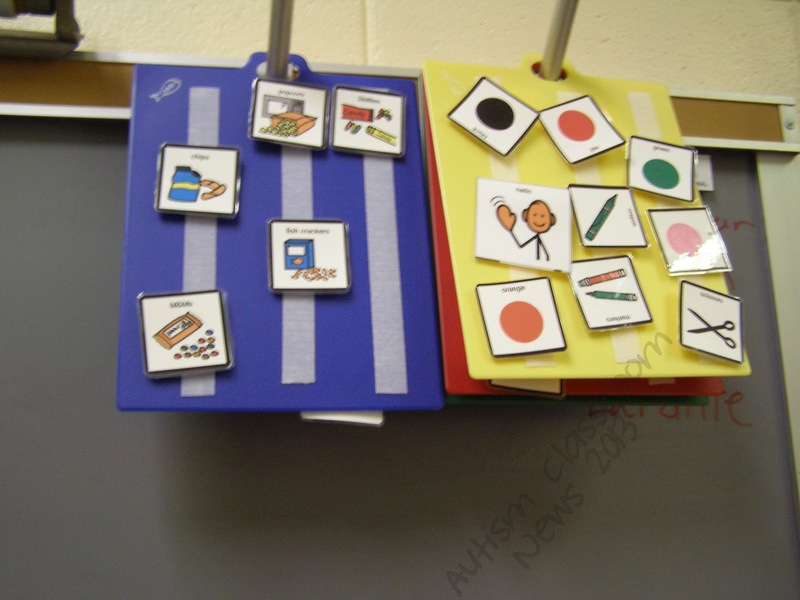 In classrooms for autism and other special needs, we use ALOT of visuals and we try to get the students to use them for schedules, participation and communication. This means our morning meetings and other group activities typically involve a lot of visuals that have to be organized. Even more they have to be accessible to the students in the group. For many years (back when we had to draw our visuals instead of using Boardmaker–you know, when there was dinosaurs roaming the earth! ), we used matte board to make the visuals, so the matte board made great boards for most situations. (Matte board is the thing framing shops use to put mats around pictures. It’s like superheavy cardboard.) At the school I worked at we were lucky that one of the parents owned a frame shop and would bring us all their leftover bits (and sometimes whole sheets) of board to use to back our visuals and use for boards. It was awesome! The boards looked like this…and sometimes the matte board was colored. 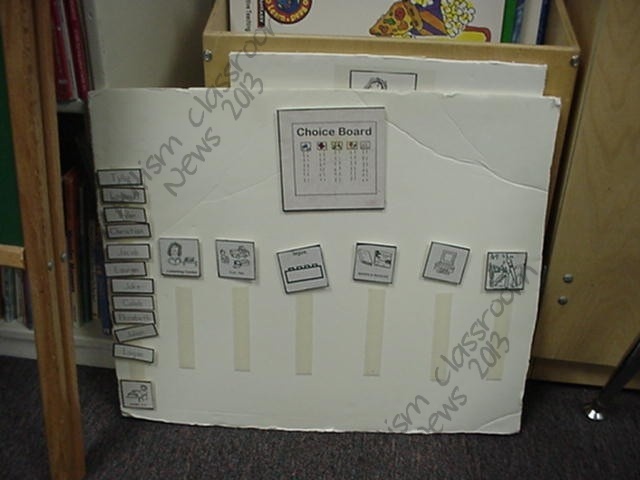 When we lost our matte board sources….and that stuff is expensive, we often use foam board. But if you look at the upper right corner of the board below, you see the problem that happens with that at times. So, enter my friend Abby. When she came to work with us, she brought this awesome tip with her. 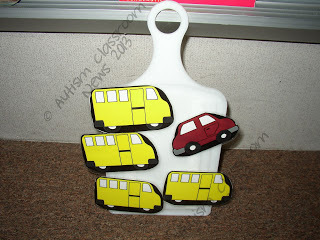 You know what works GREAT for holding visuals–cutting boards! And you can get them at the dollar store–yep sometimes you can even get them 3 for $1. 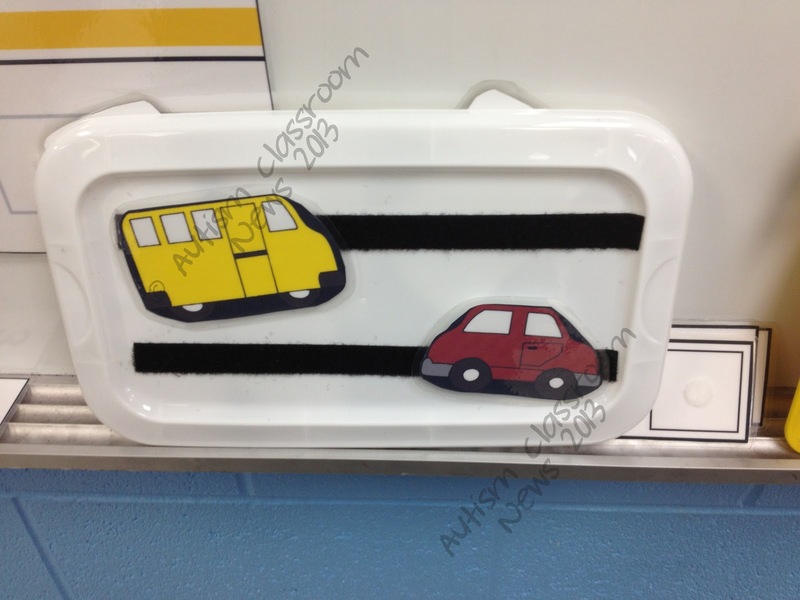 Think about it…they are stiff so they hold up when students hit them or lean on them, they have handles so they are easy for the instructor to hold on to, and they hold Velcro without problem. 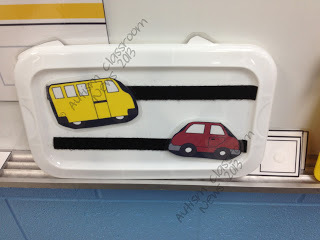 The picture below is particularly cool because you can see the cutting board and the teacher had some sort of rod sticking out of her white board that made a great place to hang them. And then, as I was just finishing this post, I went looking for more pictures and found one from a recent class we set up that made great use of an underused item. Know all those bin lids we often don’t use in work systems? Turns out they make great communication boards for small amounts of visuals too. Think my friend Sue shared that one from me and I’m pretty sure she got it from someone at the Baudhuin Preschool. And if you are looking for visuals to use in the classroom, I have a free Art board that works well with cutting boards at TPT–just click here. 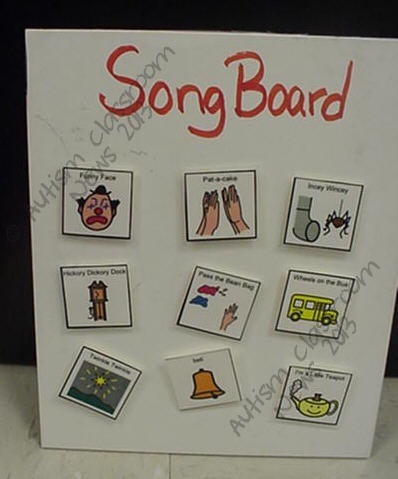 And the music choice board is only $1 (had to change it from free because of a change of Mayer Johnson’s rules. 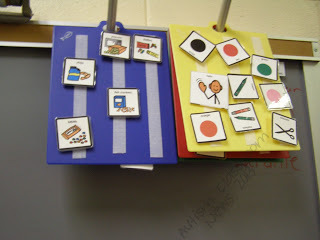 So, what do you use for communication boards in your room? Share your strategies in the comments! What a great idea!! Thanks for sharing! My little guys are pretty strong on their schedules, but they still need reminders for the steps on assignments (color, cut, then glue). I'll have to stop by Dollar Tree soon! You know for little mini schedules, tongue depressors / popsicle sticks would be a good way to put them together. I use them for sentence starters with kids too. 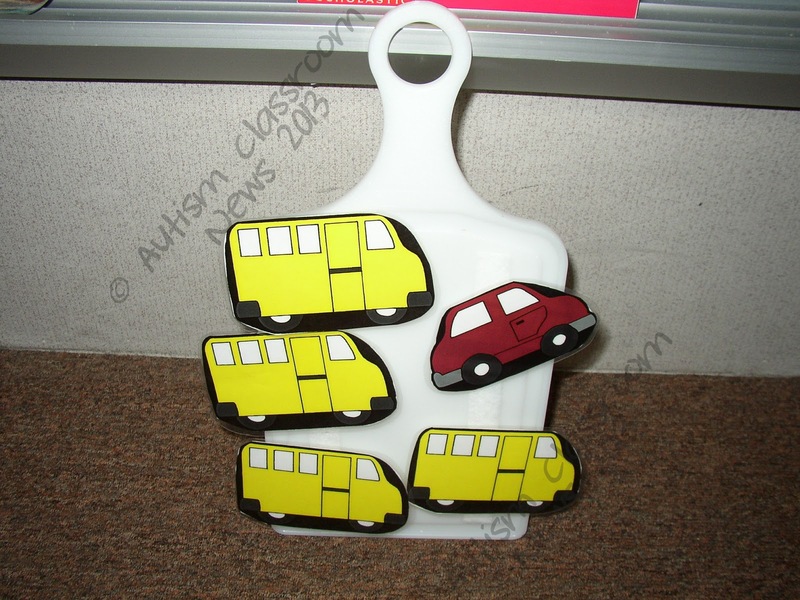 You can also use plastic lunch trays! This is a great idea! I use the large Popsicle sticks on schedules too! 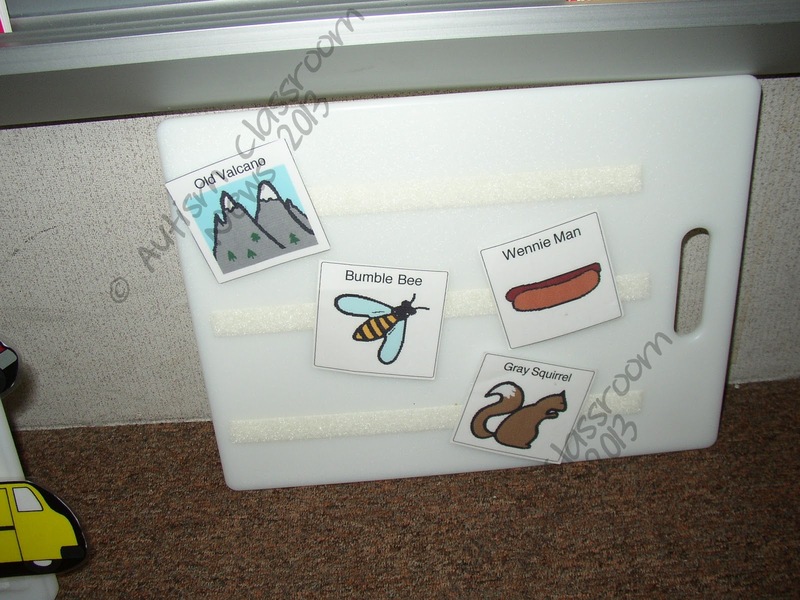 For one student, he has his schedule posted in the classroom, but for any part where we leave the room, we velcro the popsicle stick to the schedule, then the schedule pieces we need out of the room, so it's like a traveling mini schedule. I've also used large paint stirring sticks for larger portable schedules! What a fantastic idea, Erin! Thanks for sharing them! !